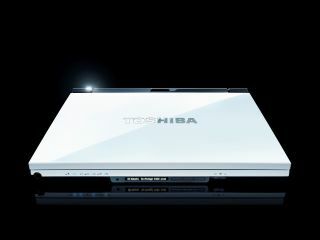 Toshiba 's new Satellite family of notebooks will be shipped with Windows Vista , and will be available for release in the US on 30 January, the company announced yesterday. The Toshiba Satellite A135 notebook series sport a 15.4-inch screen with 1280 x 800 resolution, an Intel Graphics Media Accelerator 950 chipset, 120GB hard drive, and 802.11a/b/g Wi-Fi capabilities. A 5-in-1 memory card reader is also built in. The ultra-portable A135 also has dual 2.4-inch drive bays squeezed into its 1.47-inch frame. It ships with Windows Vista Home Premium or Windows Vista Ultimate, and will be available on Vista's official launch day on 30 January. However, a Toshiba UK spokesperson confirmed today that the Satellite A135 series won't be available in the UK until mid-March. Prices start at $900 (around £455), ranging up to the $1500 (£760). UK pricing has not been decided yet.